Sofi’s Crepes reopens in Fells Point! 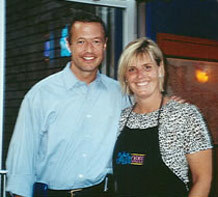 When Sofi’s Crepes in Annapolis offered a 100% donation for every “KEVIN BACON” Crepe purchase during the Bacon Brothers stop in Annapolis, Kevin Bacon dropped in to check them out. Kevin Bacon eats a ‘Kevin Bacon’ in Annapolis; jams on yacht. 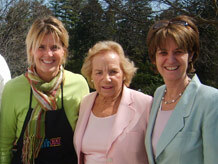 Ann Costlow on Sunday Brunch WBAL TV 11. Walking down the street, you notice a group gathered at a window shop. You pause to see what the commotion is and through the window see a machine creating mouthwatering crepes. The delicious smell grabs you by the hand and leads you into the shop to indulge your sweet tooth. Although it may feel like Paris, you’re actually in Baltimore. Winner, City Paper Best of Baltimore! A local North Charles Street favorite has just added a little wiggle room. You’ll actually be able to sit down and enjoy your order at Sofi’s Crepes.Owner/chef Ann Costlow says she’s expanded the creperie to include a small area for seating. The 20-foot-by-8-foot area – previously storage space for the Everyman Theatre next door – offers a window-front view of Charles Street. Costlow describes it as “very New York.” There is a sparkly sylestone counter along the window, with about eight stools. A banquette sits just behind, which can seat another 10 folks.Adding more sparkle to the space are a glittery vinyl floor and a rotating exhibit of artwork that will come courtesy of the Schuler School of Fine Arts at Maryland Institute College of Art and the Creative Alliance.Costlow says one thing that hasn’t changed is the menu. It still offers sweet and savory crepes – about a dozen of each – in prices that range from $4 to $8.To celebrate the “new and improved” Sofi’s, Costlow is throwing a grand-opening celebration at 5:30 p.m. Saturday. Baltimore zydeco band the Crawdaddies will perform.Otherwise, you’ll find Sofi’s Crepes open from 11:30 a.m. to 11 p.m. Thursday through Saturday and noon to 8 p.m. Sunday. Sofi’s, 410-727-7732, is at 1723 N. Charles St. Winner, Baltimore Magazine’s Best Movie Food! Click on the site links below to read the full reviews! Sofi’s Crepes, 1723 Charles St., is as petite and skinny as a stylish Parisienne. The dining room, 20 feet long by 8 feet wide, has window-view seating for eight or 10 diners, as well as a sit-down banquette. Owner Ann Costlow estimates that 25 people might be able to fit into the room if everybody squeezes. The savory selections are good, and a nice change of pace from the usual sandwich shops, but Nutella smeared on a warm crêpe is a thing of the gods. New shops and restaurants are adding vitality and jobs to the Charles Street corridor. 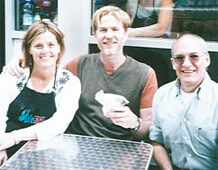 Click here to see some famous folks enjoying Sofi’s Crepes! Sofis Crepes – Expanding to Owings Mills! I discovered Sofi’s Crepes two weeks ago, and I’ve been there three times since. That’s how good it is. Tucked between the EveryMan and Charles theatres, just two blocks from campus, is a little bit of France waiting to satisfy your appetite. Popcorn and Junior Mints may never be supplanted as America’s favorite movie food, but cinephiles catching a flick at The Charles or theatre-goers getting their stage fix at Everyman Theatre have an intriguing new dining option. 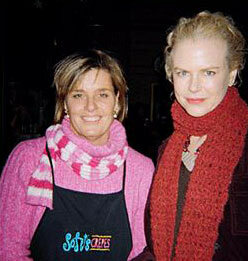 Nicole Kidman enjoying a Cinnamon & Sugar Sofi’s Crepe while working on her movie in Baltimore. John Waters at Sofi’s for the 2006 Maryland Film Festival. 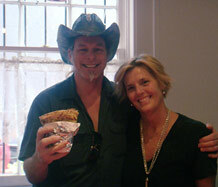 Even Ted Nugent loves Sofi’s Crepes! Cal Ripken at Sofi’s Severna Park with Abby Larken, owner of the shop!